Experiencing Public Relations examines the everyday experiences of PR practitioners in order to better understand how public relations is perceived by those outside and within the field. The book aims to provoke debate around the nature of public relations by looking at how it is defined at a theoretical level, compared to how it is lived and represented in the real world. Chapters feature work from some of the world’s leading public relations scholars. They cover a diverse range of subjects, such as representations of PR in fiction and film, terrorist use of public relations, the impact of social media and a study of ‘dirty work’ within the public relations industry. 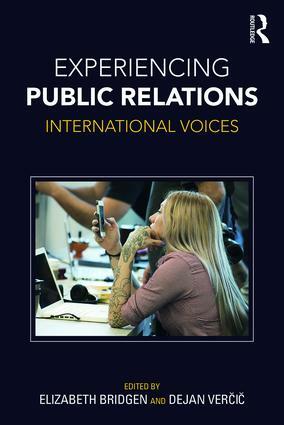 The book also explores international PR practices, presenting analysis from contributors based in Australia, Germany, India, New Zealand, Norway, Poland, Russia, Slovenia, South Africa, Spain, Sweden, Taiwan, UAE, UK, USA and Venezuela. Experiencing Public Relations goes beyond the ‘frontstage’ scholarship of public relations to bring together stories of public relations in daily life, revealing how influential theories work out in practice and translate into different cultural and social contexts. This book will provide researchers, professionals and students with a vital perspective on the inner workings of public relations today. Elizabeth Bridgen is Principal Lecturer in Public Relations at Sheffield Hallam University, UK. Her research explores the lives of public relations practitioners with a particular focus on gender, diversity, and the impact of technology on working lives. Dejan Vercic is Professor and Head of the Department of Communication at University of Ljubljana, Slovenia. His research focusses on globalization and strategic communication. He is a member of the European Communication Monitor (www.communicationmonitor.eu) research team, and since 1994 he has organized BledCom (www.bledcom.com).